A pig farmer in Norfolk has slashed pneumonia rates by over 50% by investing in new, insulated housing. Olivia Cooper finds out more. Respiratory diseases are a big problem for pig producers, with enzootic pneumonia estimated to be present in 80% of the UK herd. As well as limiting growth rates through poor feed conversion, it can also pre-dispose pigs to other infections, with AHDB Pork estimating losses at around £3 a pig. But investing in new housing can slash the incidence of respiratory disease as well as increasing labour efficiencies and productivity, as Norfolk farmer Stewart Southgate has discovered. Until recently, he and his son Andrew kept 2,400 finishing pigs at Rockland St Peter, Norfolk. But a switch to an all-in, all-out system meant he did not have sufficient room to keep the same number of pigs. “Our buildings were also getting old, having been built in the early 1970s, so we decided to knock them down,” he explains. The steel-framed building is 3.5m to the eaves and 5.5m to the roof ridge – deliberately high to allow for change of use should the need arise. It has a concrete floor with a central passageway and lowered levels running the length of the building on either side as a ‘wet’ area for excrement and wallowing. The pigs are housed in groups of 44 per pen, with solid plastic gates which can shut in a variety of ways for easy cleanout. “We clean out every day with a tractor and scraper; we just shut the gates off and drive straight down the shed – it’s very easy and labour-saving,” says Mr Southgate. The panels sit below both the corrugated fibre cement roof and the purlins, so the ceiling itself is completely smooth. This not only improves bio-security – as it’s easy to clean – it also aids the building ventilation, as there are no barriers to air flow. Fresh air comes in from the sides of the building, rises to the ceiling, and exits through the centre open ridge which has a raised cover to prevent rain ingress. 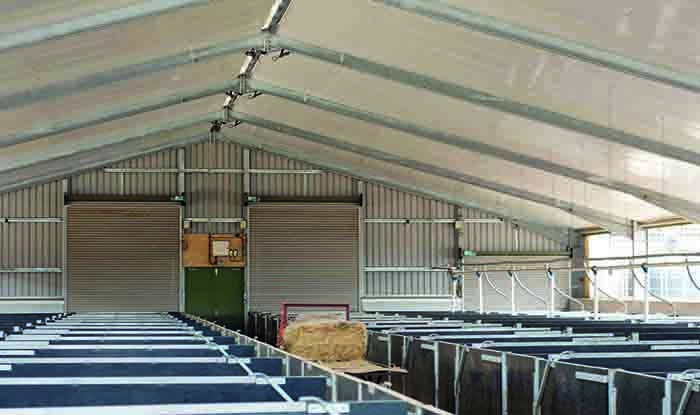 Unusually for a pig shed, this building has open sides above the solid plastic panels, with automatic sliding curtains to control the wind and internal temperature. The computer system takes readings from the internal thermostat, with an external weather station monitoring the outside air temperature, prevailing wind and rainfall. This in turn controls the internal climate for the pigs, based on their age, weight and stocking rate. 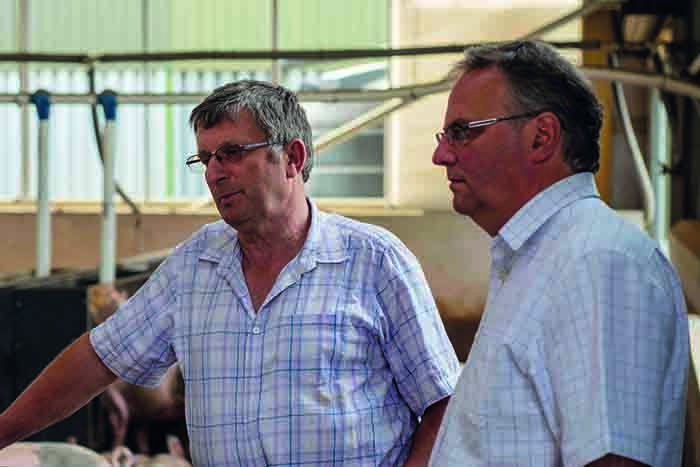 “We stock the barn with 2,000 piglets using a target air temperature of 23-24⁰C at pig level, and then reduce the temperature by about 1⁰C each week to around 18-20⁰C,” explains Mr Southgate. As the piglets grow, he moves 700 to an older shed, to allow for RSPCA-assured stocking rates. However, the greatest benefit is in improved health. Fluctuating temperatures and poor ventilation are not good for livestock, and in the older sheds the pigs suffered from pneumonia, with those up to 12 weeks old faring the worst. “We have a lot less respiratory disease in the new shed,” says Mr Southgate. “Pneumonia cases have dropped by at least 50%, and mortality is at 5% compared with 10-12% in the old sheds.” Across 2,000 pigs that soon stacks up to a phenomenal financial saving. With 500 acres of arable crops, Mr Southgate uses his own straw for the pig bedding, with the 2,000 pigs getting through a tonne of straw each day. He then uses the resulting manure to fertilise the arable ground. The pigs are reared on contract for Rattlerow, so they arrive on farm as four-week-old 7kg weaners and depart as 15-20 week-old 105kg baconers. Rattlerow provides the feed – in the form of five different pellet rations as the pigs grow – as well as the vet and medicines, while Messrs Southgate provide the facilities, management and straw. “We have automatic ad-lib feeding, and installed two feed storage bins for each row of pens so that we can finish one ration off before moving onto the next,” says Mr Southgate. He keeps the boars and gilts separately, and Rattlerow selects the finished pigs over a five-week period. “We haven’t been recording feed conversion efficiencies but we’re going to start.” Once all the pigs are finished, he washes and disinfects the entire shed and leaves it empty for two weeks before restocking. Expanding will make it worthwhile employing a full-time manager for the pigs, and enable Mr Southgate to step back into retirement. Could balcony systems be the answer to our housing problems?